Well done!! Keep working hard and take it one day at a time!! Congratulations!! I remember the feeling I had when I got to 30 days. It’s great. Keep that positivity going forward! Awesome work! The first month is one of the toughest, and you’ve gotten through it! Congratulations!! 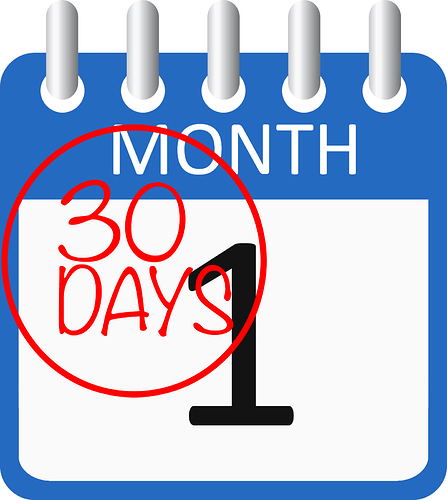 30 days is a big deal!! Way to go. You sound like you are ready to get living. Congratulations and keep it up. Congratulations on your 1 month milestone!!! This calls for a pizza, steak, or whatever your jam is celebration dinner!!! Keep fighting one day at a time!!! 30 days aint easy but each day after gets a just little easier. Congrats to you on your success. Thank ya for making me smile Congrats on 30 days!